I love a tiny bodysuit. I especially love a tiny stylish bodysuit. When the racks are filled with plain or bold coloured clothing, it’s a breath of fresh air to see these delightful crisp white bodysuits showcasing a beautiful modern art print. We’ve mentioned The Modern Baby Co before and we’re excited to feature them again with the arrival of these charmingly scrumptious printed baby bodysuits. Made from stretchy cotton and using eco-friendly inks, there are six whimsical animal designs to choose from. There for your selection are Little Bird (in both girl and boy versions), Little Giraffe, Little Peacock, Little Whale and my favourite, Little Lion. If you can’t get enough of these prints then you’re in luck because also up for grabs are beautiful Mini Art Cards. Featuring the same prints as the bodysuits, these Mini Art Cards stand seventeen centimetres tall and twelve centimetres wide. A simple way to add that perfect colour touch to any décor. 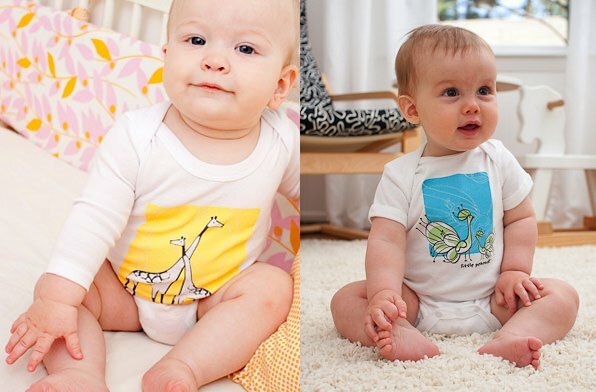 Short sleeved bodysuits are priced at US$16 and the Mini Art Cards $8 from The Modern Baby Co. Delivery is available to Australia.